-Lever to fold outward to prevent breakage in the event of a crash. -Automatic lever position restoration provides quick recovery from the crash. -Ultra precision machine cut for super light weight construction, high precision and quality. -Made of durable aluminum for extreme strength. -Direct replacement for stock levers. No modification! -Notice: Make sure you can find your bike model and year in application please. -You will receive exactly same as pictures. QUANTITY:1 * Brake Lever And 1 * Clutch Lever As Pictures.Installation Instruction NOT Included. FUNCTION:Lever to fold outward to prevent breakage in the event of a crash.-Automatic lever position restoration provides quick recovery from the crash.Direct replacement for stock levers. No modification! 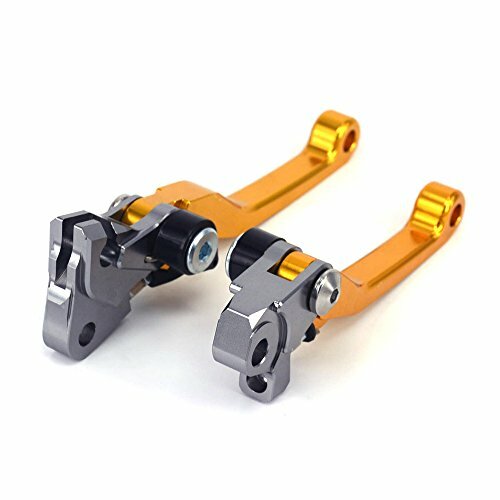 HIGH QUALITY:The Levers Are Made Of Durable Aluminum For Extreme Strength.Ultra precision machine cut for super light weight construction; high precision and quality.Perfect anodize surface treatment.Very Smooth Movement.Hard anodized finish.Easy To Install. AFTER SALE:Manufacturer warranty for 90 days from date of purchase.We are committed to provide excellent customer service,If you have any questions,please contact us.We will try our best to solve your problem.